First Choice Tree Care is a full-service plant health care and tree service company with locations in Mosinee and Mequon, Wisconsin. All of our arborists have earned the ISA Certified Arborist credential. We provide a wide range of year-round tree care services throughout Central and Southeast Wisconsin. Excellent tree and shrub focused skills including: plant identification, insect & disease identification, PHC treatment techniques, equipment operation and maintenance, and worksite safety. Additionally, successful Arborist candidates will be familiar with and be proficient at climbing, pruning and rigging techniques. Ability to communicate effectively with clients and coworkers in both verbal and written form. Ability to complete assigned work with minimal supervision. ISA certification, or ability to become certified upon eligibility. WI Pesticide Applicator Certification (3.0), or ability to become certified. Clean driving record. CDL preferred. 2- or 4-year degree in Arboriculture/Urban Forestry or closely related field. Our full-time compensation package includes competitive salary based upon merit, health insurance, life insurance, short-term disability insurance, IRA retirement plan with company matching contribution, paid holidays, paid vacation, sick leave, tuition reimbursement and annual personal gear and clothing allowance. 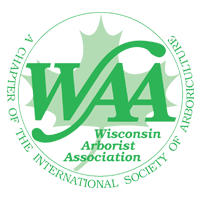 First Choice Tree Care Inc.
First Choice Tree Care Inc. is also accepting applications for the Wisconsin Arborist Apprenticeship program. This is a formal apprenticeship program leading to journey worker status. The program is coordinated by First Choice Tree Care, Inc. and the Wisconsin Department of Labor – Bureau of Apprenticeship Standards. Successful applicants will work from our Mequon, Wisconsin office. This is a permanent year-round opportunity, with both on-the-job and classroom learning components. First Choice Tree Care is a full-service plant health care and tree service company with locations in Mosinee and Mequon, Wisconsin. We provide a complete range of year-round tree care services throughout Central and Southeast Wisconsin. At our Mequon location, we also provide comprehensive landscape construction and maintenance services. The ability to work outdoors in year-round weather conditions. The ability to communicate effectively with clients and coworkers. A high school diploma. Some education beyond high school preferred. Must be physically fit, willing and able to learn safe tree climbing techniques, and able to lift up to 70 lbs. Ability to pass pre-employment drug screening. Full-time compensation package includes competitive wages, health insurance, life insurance, short-term disability insurance, matching retirement contribution (IRA SIMPLE plan), paid holidays, paid vacation, sick pay and an annual gear and clothing allowance. All First Choice Tree Care facilities are smoke-free, drug-free environments.